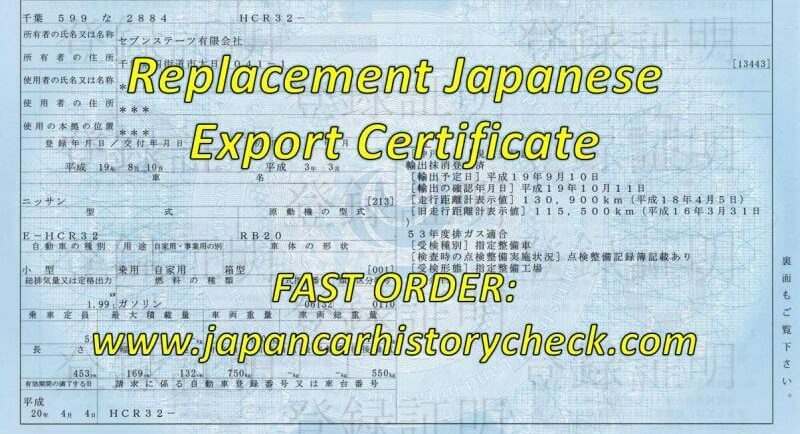 Lost your Japanese Export Certificate & need a replacement Japan car title ? 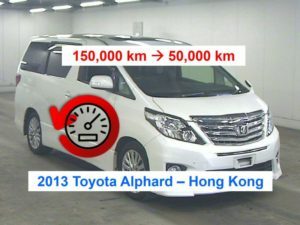 If you’ve lost your original Japanese Export Certificate and need an official replacement – whether it is for a Japanese or foreign made car – we can obtain an official replacement Japan car title (duplicate Japanese registration certificate) for you directly from the Japanese Transport Authority (MLIT). Usual timeframe is 3 to 5 business days but if you need it FAST let us know and we will do our best to help you out. 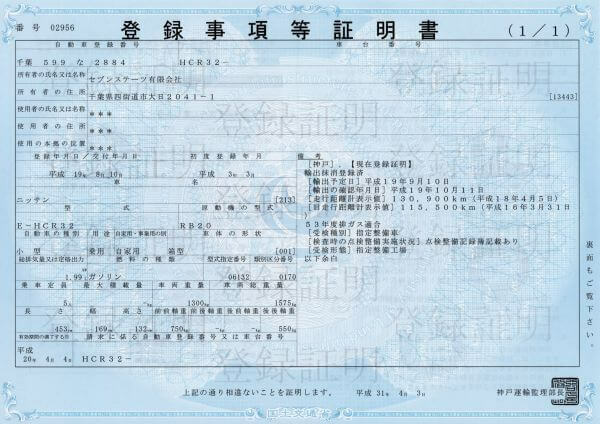 The Japanese Export Certificate / Japan car title / Japan Registration Certificate is usually required to legally register an imported Japanese car in another country. 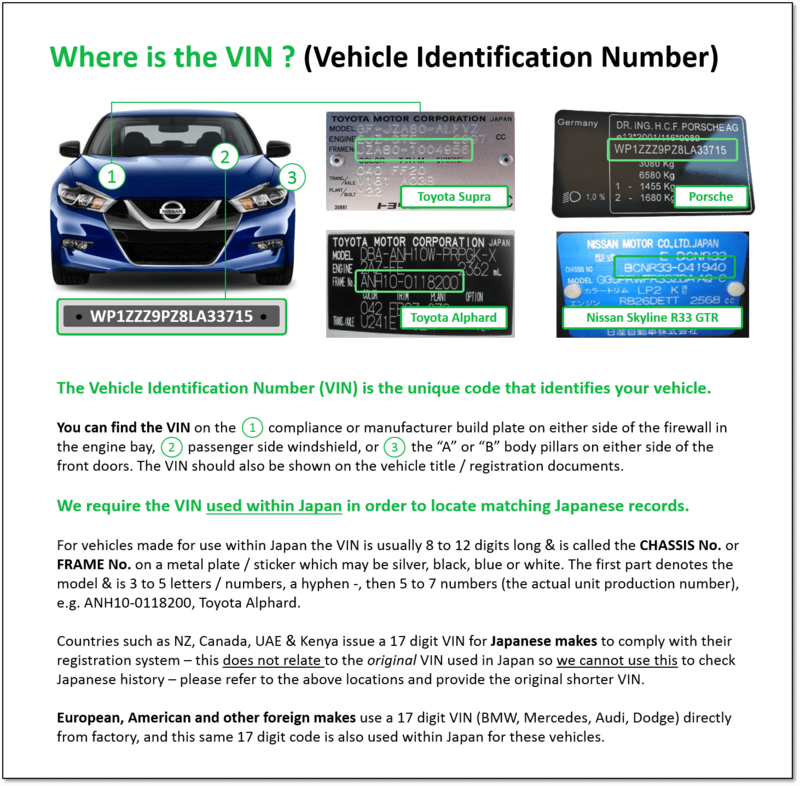 The replacement Japanese car title we supply is an official watermarked document obtained by our staff directly from the Japanese Registration Authority, using the VIN for your vehicle. 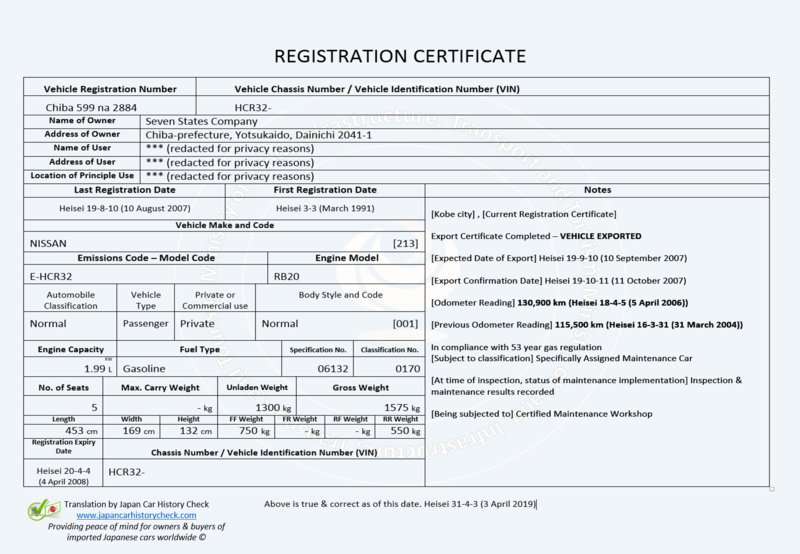 This is as good as the original Japanese Export Certificate to prove ownership for registration – it can be used in your country to register a car imported from Japan including proof of the first registration date in Japan PLUS it can prove the age of the vehicle for Customs clearance in countries such as the USA and Canada. 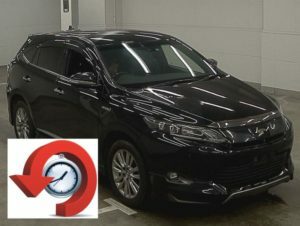 The replacement Japan car title contains the SAME INFORMATION as the Japanese Export Certificate including the last two registration events and odometer readings in Japan prior to export. We provide a high quality scanned color PDF of the Japan car title document by email together with English translation (example below) – often we will have both the title and translation to you within 2 days however please allow 3 to 5 business days from the time of placing your order depending on staff availability and workload, and public holidays in Japan. * NOTE that March is a particularly busy month for the MLIT offices across Japan so please allow additional time if ordering a replacement Japan car title during that month. The Japanese Registration Authority (MLIT) are open from Monday to Friday – one of our staff will physically go to the MLIT office to obtain your document. 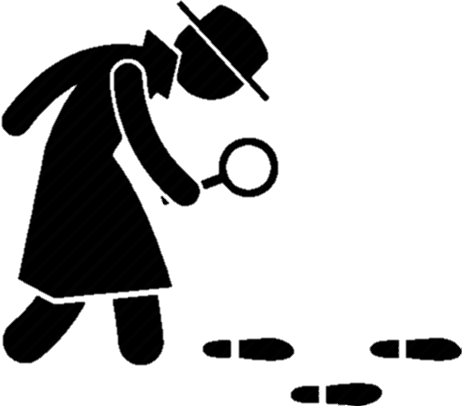 We can also post your original title document by Express Mail Service (EMS) if required – allow 3 to 7 business days to receive your document and we will provide an online tracking number so you can monitor delivery. 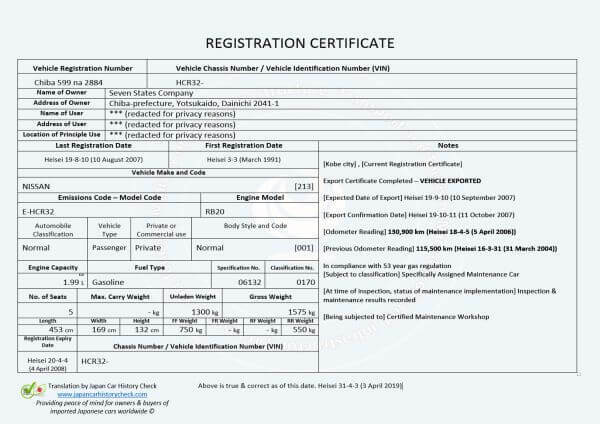 The official watermarked replacement Japan car title document shows the same information as the Japanese Export Certificate. Registration renewal for passenger vehicles in Japan occurs 3 years from new, then every 2 years. The replacement Japan Car Title is issued by the Transport Bureau of the Ministry of Land, Infrastructure, Transport and Tourism Japan (MLIT). When a car is exported from Japan, the original Japan Car Title is converted to an Export Certificate by Japanese Customs. The car must be exported within the date range printed on the Export Certificate or penalties apply. 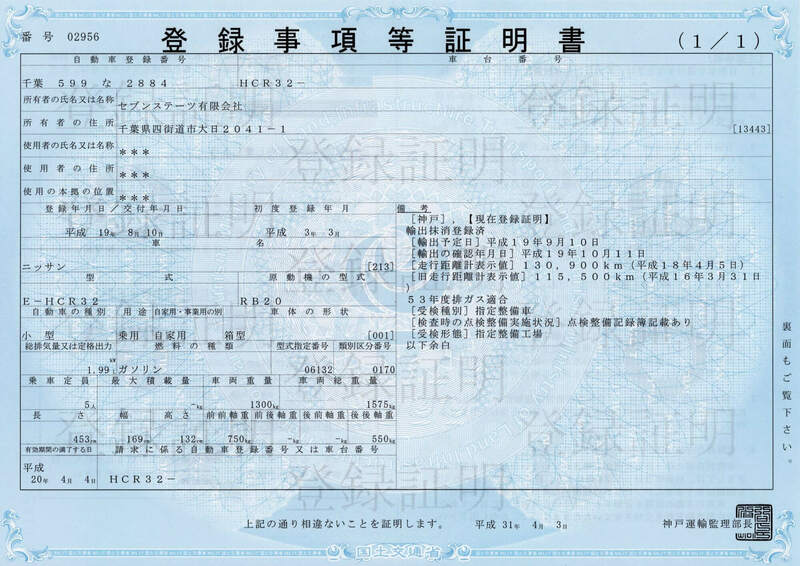 Following shipping, the Japanese Export Certificate is returned to the exporter, who should then send the original document to the importer in the other country. But sometimes the Japanese Export Certificate is never sent, becomes lost, or is simply not passed on by the importer (usually a dealer) to the new owner (you). 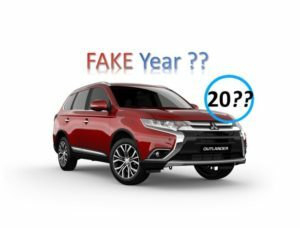 The Export Certificate shows up to the last two odometer readings at re-registration events in Japan, so this is one common reason why it is not passed on by importers who have falsified the odometer and don’t want you to find out. 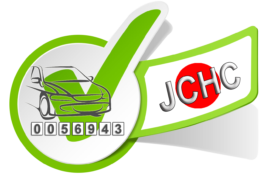 We will supply your replacement Japan car title document within 3 to 5 business days. Allow another 3 to 7 business days for worldwide EMS postage (with tracking) if the original document is required. We send duplicate Japanese car titles to people in many countries including USA, Ireland, New Zealand, Australia, Canada, Sweden, Norway, Germany and France. So we can help you wherever you are located. 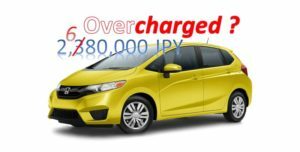 The replacement Japan car title is only for vehicles exported from Japan within the last 15 years – beyond this we cannot guarantee records will be available when we request them. Not available for < 990cc engine cars, motorcycles or scooters. 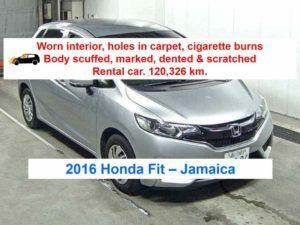 The Japanese car title does not record emissions data.